save the lives of our great veterans and support our heroes in need. 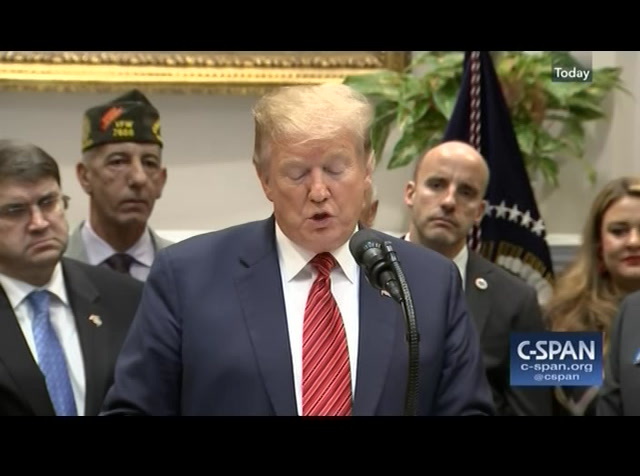 we've worked very hard on choice for the veterans and so many other programs. and have done a really great job in so many ways. 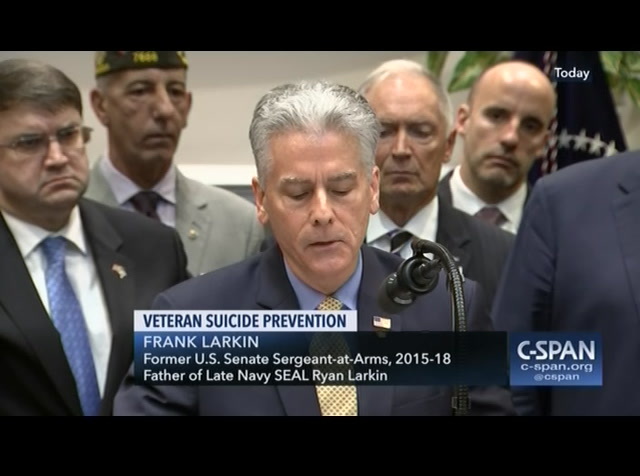 veteran suicide is something that's been an incredible thing to watch, hard to believe. it's tragic. today, we could help end this crisis. i'd like to thank secretary wilky for being here today with us. he's done a fantastic job as secretary. he's making tremendous progress at the v.a.. we're also profoundly grateful to be joined by many of our nation's leading veterans, service organizations, the best and all of the state and local veteran leaders. and i want to thank everybody for being here. thank you all very much. from the first moment they return to civilian life. they leave a military life and go to civilian life, and it is different. we must keep our promises to those who keep us free. through today's action i am launching the prevent initiative . 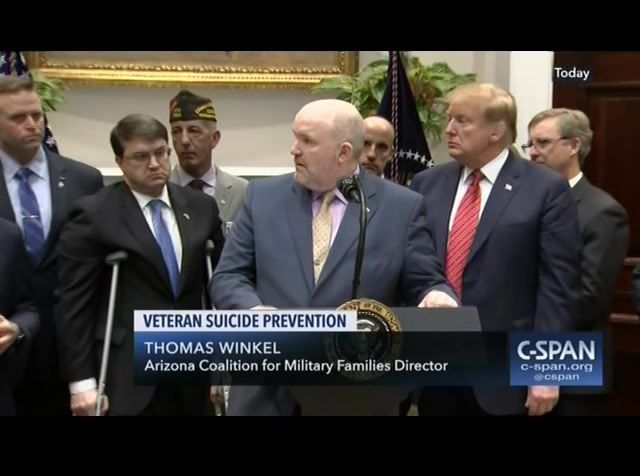 the president's roadmap to empower veterans and end the national tragedy of suicide. 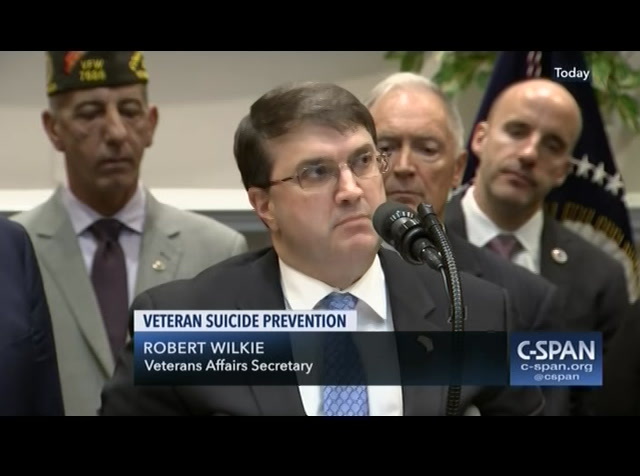 this order creates a new cabinet level task force cochaired by secretary wilkie. 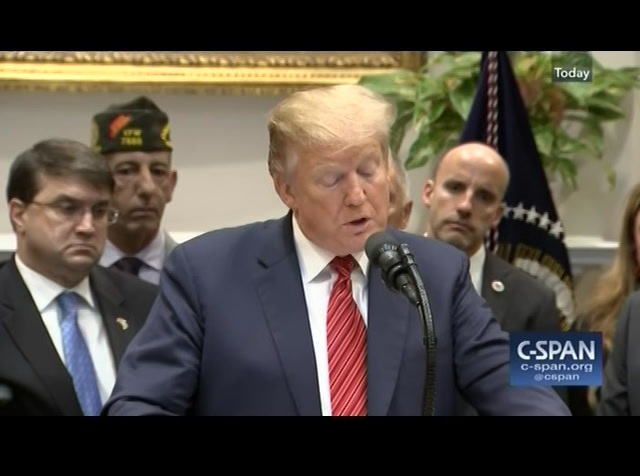 the task force will create a comprehensive national public health roadmap that brings together federal and local government, along with private sector partners to improve the quality of life for veterans and turn the tide on this crisis. we are being helped by her strong economy. -- our strong economy. it is a lot easier for people to get jobs, including veterans. 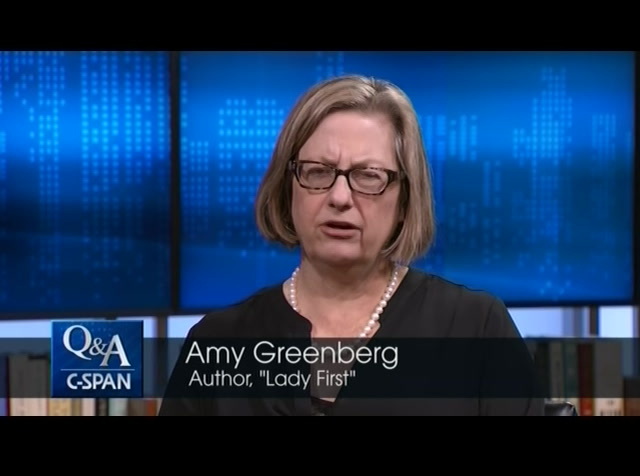 a lot of companies are giving priority and dark request -- priority to veterans. the task force will be tasked with developing a research strategy so we can identify, intervene, and help veterans during a time of need. research andin scientific advances, we can better understand the trauma and how to restore their faith and their health. 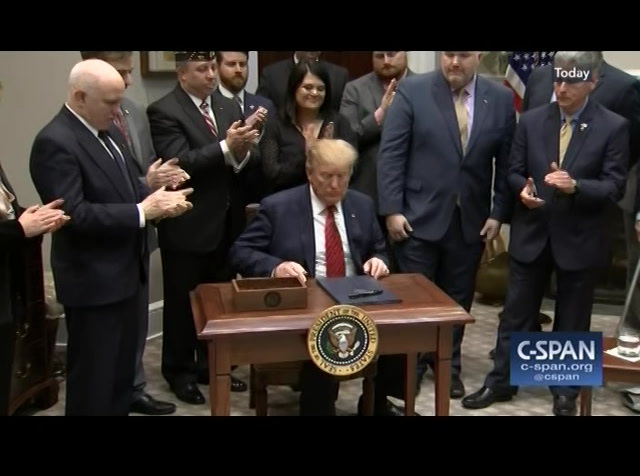 under this order, my administration will also work with congress to pass legislation providing resources and assistance in the form of grants to communities so that they can empower veterans with critical information, services, and networks of total support. 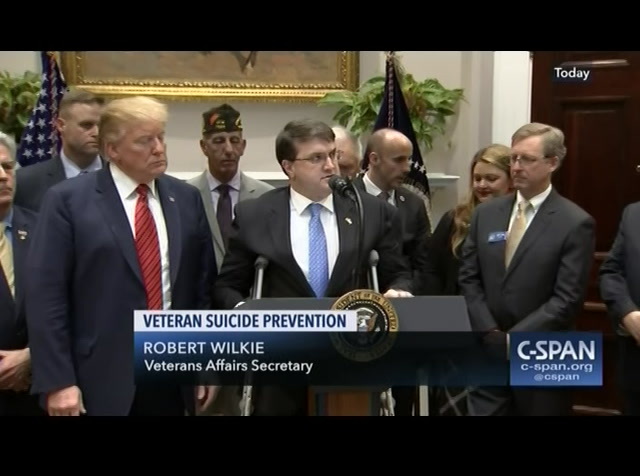 we are going to take care of our veterans. we are working so hard on this. we are making so much progress. we are going to take care of them like never before. veterans are america's greatest national treasure. a lot of people understand that. some people don't. our greatest national treasure. they kept us safe and we are going to keep them safe. they courageously fulfill their duties to our nation. now we must fulfill our duties to them. here with us today is frank. his son ryan followed in his footsteps to become a navy seal. terrific young man. tragically, ryan is no longer with us. frank, i would love to have you say a few words, please. >> thank you, mr. president. play at the same time, completely focused on stopping this problem. we need collaboration, integration of data, and unity of effort across dod, the v.a., ths, academia, and the private sector. we need a holistic approach with the heightened sense of urgency to push scientific research. 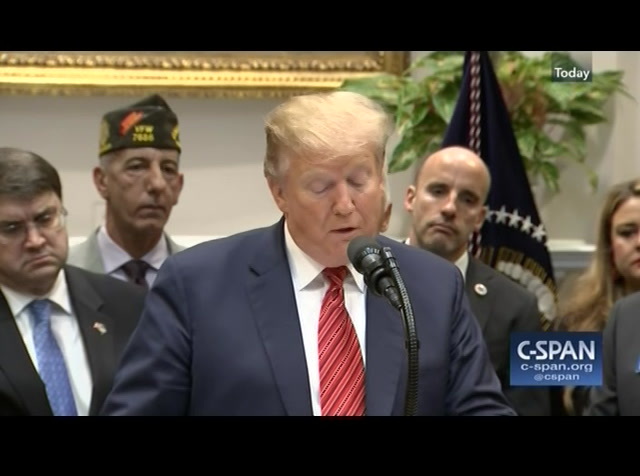 as we develop knowledge, as we experienced with the manhattan project and space exploration, we will inform on other disease processes and therapies that will go beyond the veteran community. 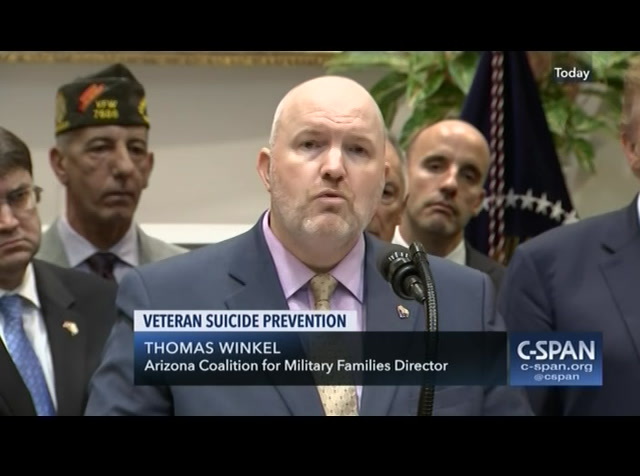 i received calls almost weekly from special operators past and present seeking help. they want to know what is happening to them. they are experiencing unexplained changes. they want to know if the pain will get better. if they will return to being the person they once were. i have to commend my own seal community for embracing this challenge. ryan got left behind. they are working hard now to get it right, collecting exposure data to advance the research, increasing baseline health surveillance and changing tactics to reduce exposures, especially in the combat training environment. we also need to recognize invisible wounds suffered on the battlefield. the monetary cost of a purple heart award is low. a few dollars for the metal itself. but the emotional impact is very high to those suffering daily with these obscure injuries. to be recognized for their sacrifice. mr. president, following this event i'm going to arlington national cemetery to tell ryan he is still making a difference. that he is still helping his boys. 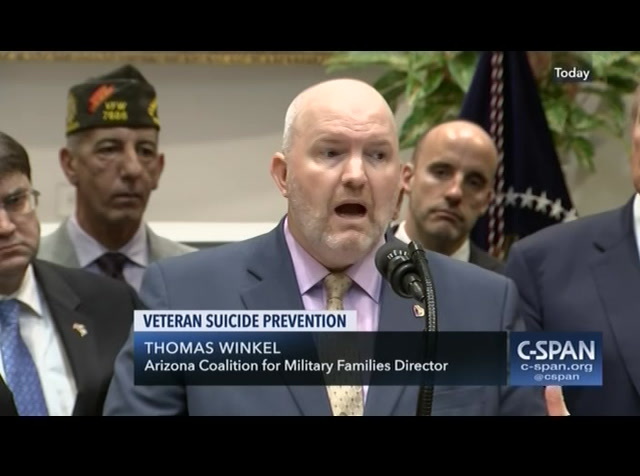 we cannot leave our men and women behind. 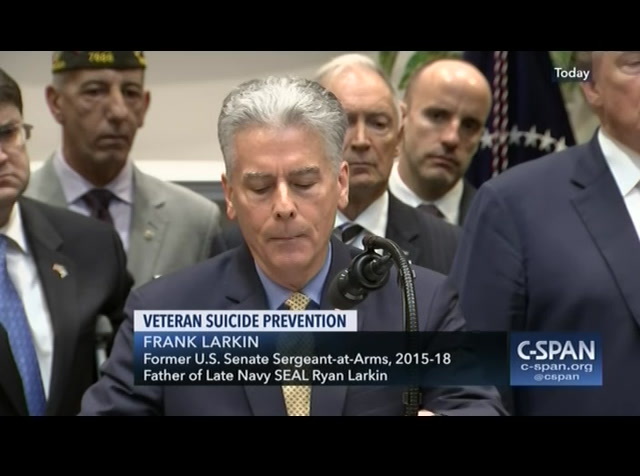 to our veterans and their families, do not lose hope. we will find a better way. remember, we made a promise to take care of those who served us. failure is not an option. 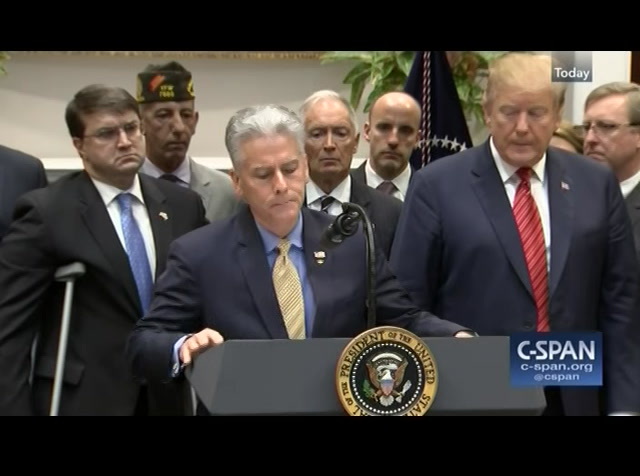 mr. president, thank you. [applause] pres. 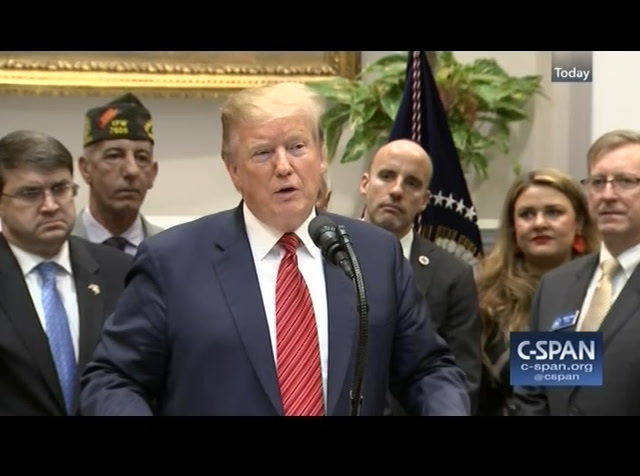 trump: thank you very much. also here today with us is thomas winkle, a marine corps veteran. 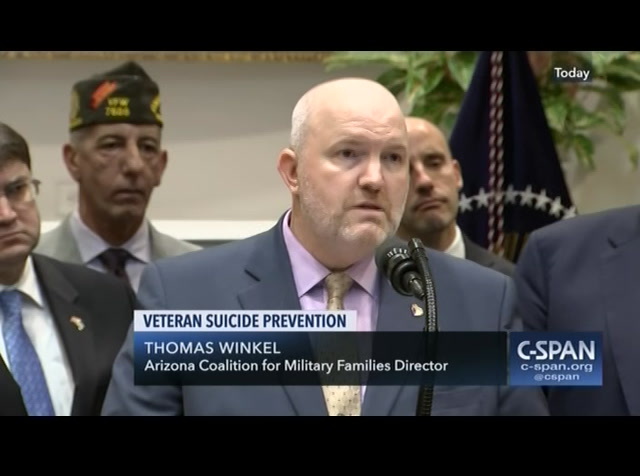 he is the director of the arizona coalition for military families, and the creator of a nationally recognized community collaboration model called be connected. thomas, could you please say a few words? >> thank you, mr. president. i greatly appreciate being able to be here today. frank, i appreciate your words. i am sorry about your son. he is in our hearts. you are in our hearts. known someone who has died by suicide. it is hard. it is painful. we have the ability to stop it. the way we were able to do this is that we worked with a no wrong door and no wrong person approach. that means every single organization was engaged. every single organization was involved. had a stake in veterans and their thriving. lawyersve mechanics and and doctors and teachers and first responders, and we have hotel clerks. one of my favorite stories is a hotel clerk that noticed a person that was checking in happened to be a veteran, that they were struggling in a variety of different ways. hotel clerk did not know what to do. he called the be connected line. they coached him through. the clerks goes up to his room, knocks on the door, and says, i just wanted to check with you. you seemed like you might be distressed and i wanted to see if there was anything i could do. the individual said, i'm so glad you came up. i'm so glad you talked with me. i was sitting here contemplating how it was going to die. not if. you may have just saved my life. we hear these stories consistently. it takes the entire community to be able to do this. our belief is that everyone knows what to do when an individual is in trouble, they will act. mr. president, we greatly support this act, or this initiative. we deeply appreciate everything you have put into this. it is going to make a huge difference. long time now he has been secretary, we have had so many good stories about what is happening generally at the v.a. we are extremely proud of choice. 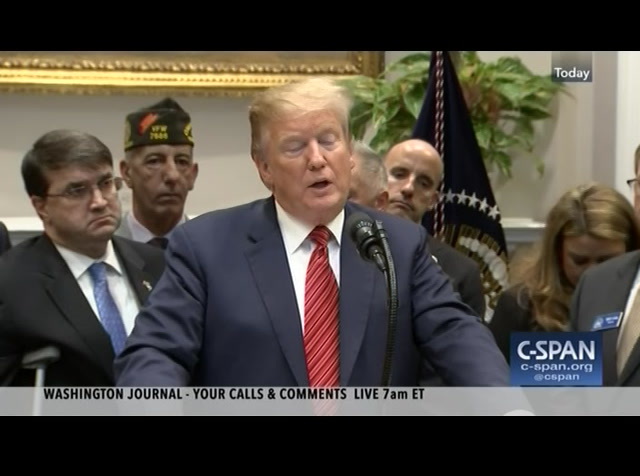 it has been decades they have been trying to get choice were a veteran can see a doctor, the lines are long, they don't have weeks, nine days, three 10 weeks, never get to see a doctor. people go online and they are not feeling well and they end up being terminal by the time we see a doctor. we have great doctors. 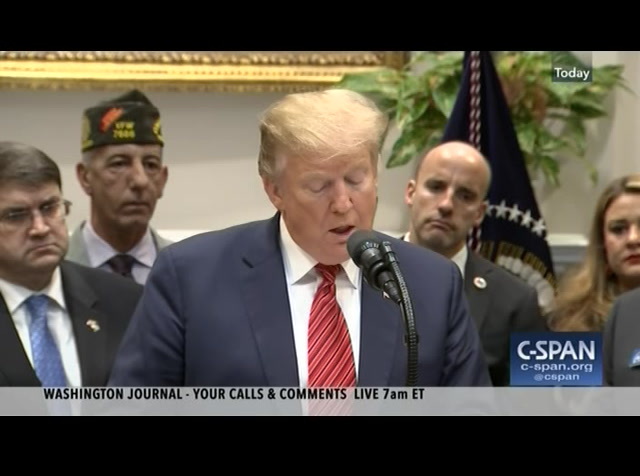 we have great doctors in the v.a. when you see them, they are as good as anybody in the world. put itan who is really all together is secretary wilkie. sec., please say a few words. 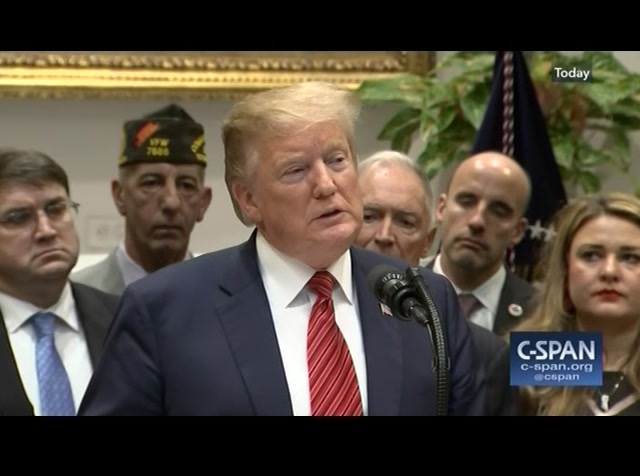 thank you, mr. president.
. have said this to you before apart from the honor of serving in your administration, i am what passes for an amateur historian and there has never been a campaign or administration where the candidate and the president put veterans centerpiece of his campaign and his administration until you did that. i speak for all of us who have worn the uniform in whatever capacity we have served. we cannot thank you enough for that. 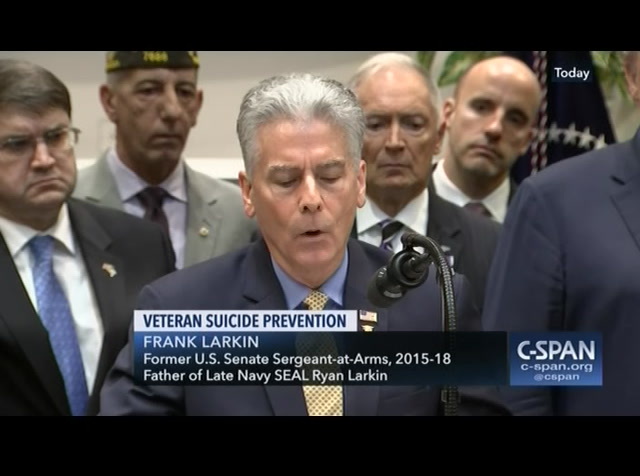 , three department of veteran affairs heroes put their lives on the line to keep a fellow veteran from taking his own life. in the west palm beach v.a. medical center. pres. 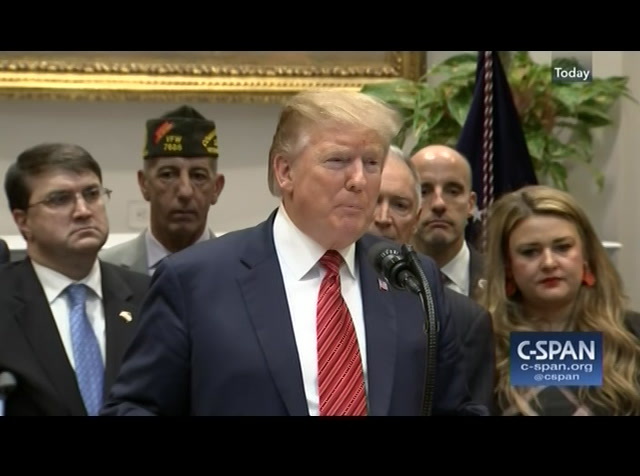 trump: thank you very much. where is frank? here you go, frank. [applause] >> we have got to keep our eye on the ball. pres. 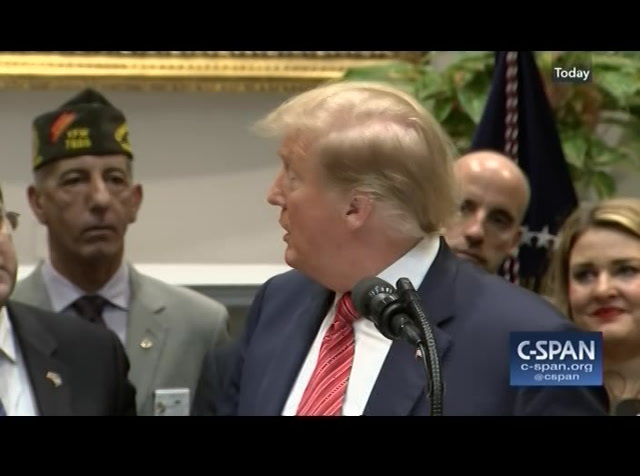 trump: thank you, frank. you can pass these out. thank you very much, everybody. 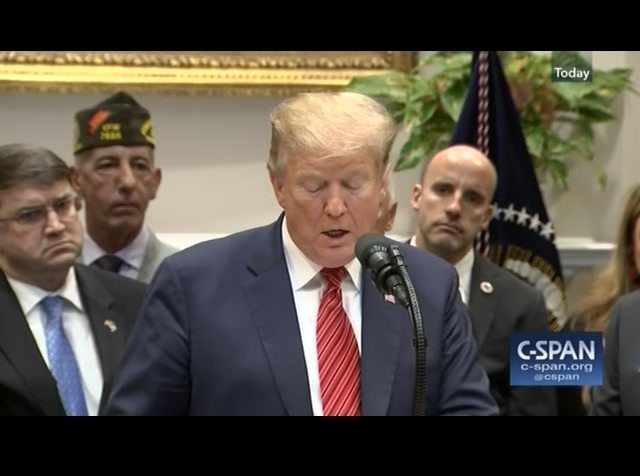 regulation cuts, whether it is the veterans administration, what we have done with choice and so many other things nobody thought would be possible to get past. no administration has done it in the first two years what the trump in ministry should has done. what the democrats want to do, they could not stand losing in 2016. i see it all the time. i saw a certain person get up yesterday, the anger, they just have not gotten used to the fact that we won a lot of states that have not been won by republicans in a long time. 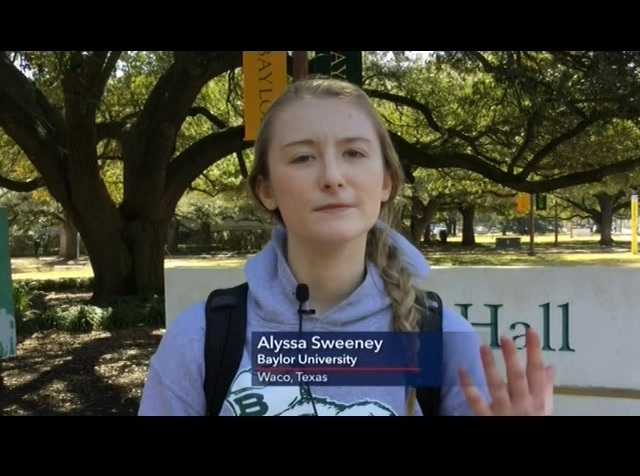 what they are saying as the campaign begins. instead of doing infrastructure, instead of doing health care, instead of doing so many things they should be doing, they want to play games. president obama, from what they tell me, was under a similar kind of a thing. they did not give one letter. many requests were made. , because i would rather see them do legislation. things we agree on, like infrastructure. but they want to focus on nonsense. by thinkingto end all the people in this room today -- thanking all the people in this room today. 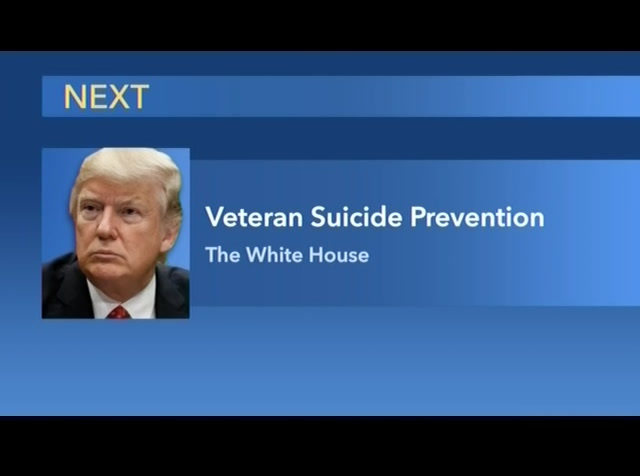 the job you have done for the v.a. is incredible. keep up the good work. thank you very much. 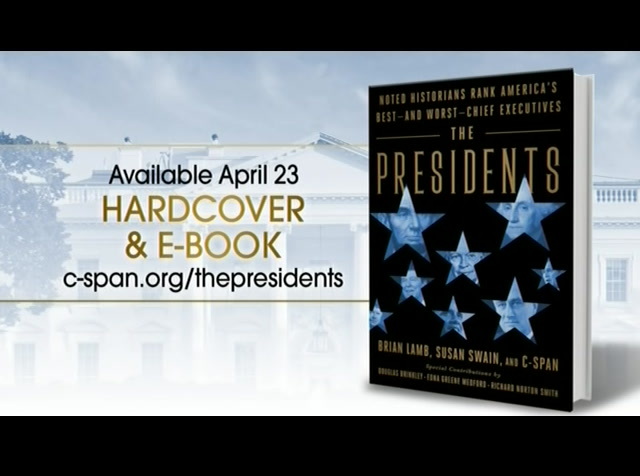 preorder your copy of the hardcover or e-book today at c-span.org/presidents. sold --ver books are wherever books are sold. hrthe u.s. house takes up one, legislation to reform campaign-finance rules, ethics laws, and voter registration issues. 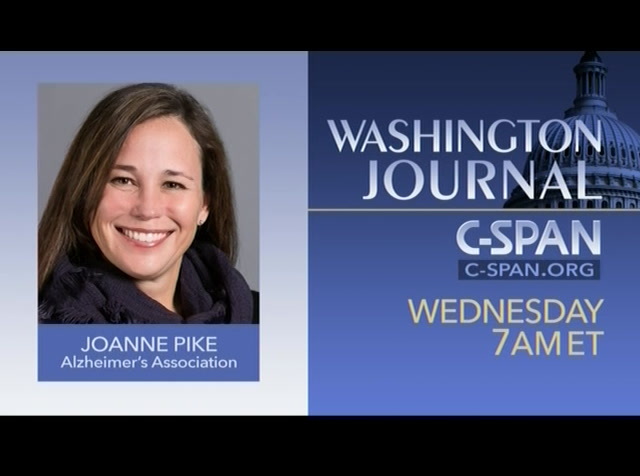 eastern on10:00 a.m. c-span. on c-span two, the senate returns for work on the judicial nomination of chad breather to be on the sixth circuit court of appeals. at 10:00 a.m. on c-span3, homeland security secretary kirstjen nielsen testifies on border security. 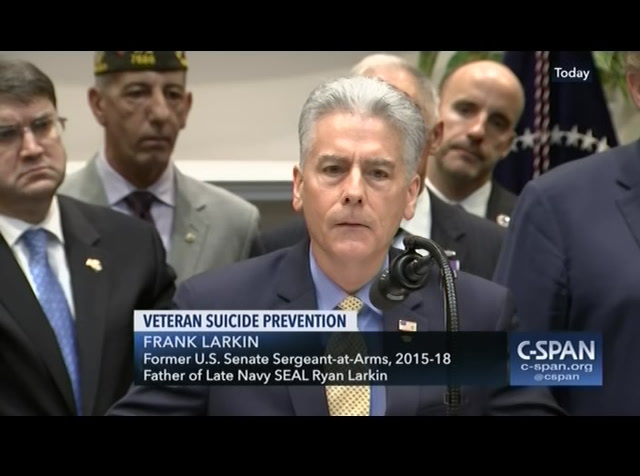 at 2:30 p.m., the senate armed services committee looks at the military sexual assault prevention and response. 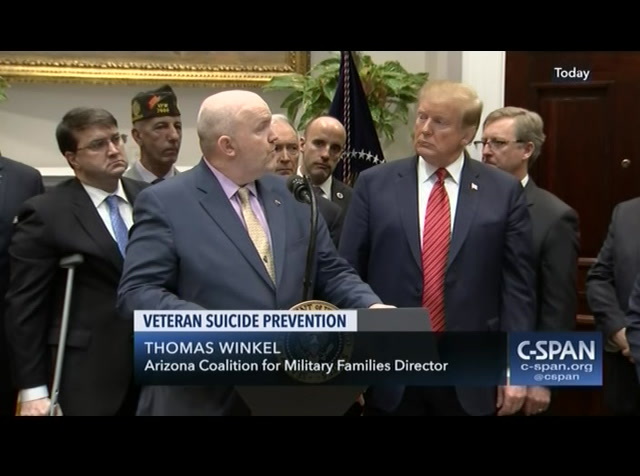 President Trump delivered remarks and signed an executive order in the West Wing's Roosevelt Room establishing a task force to address veteran suicide. 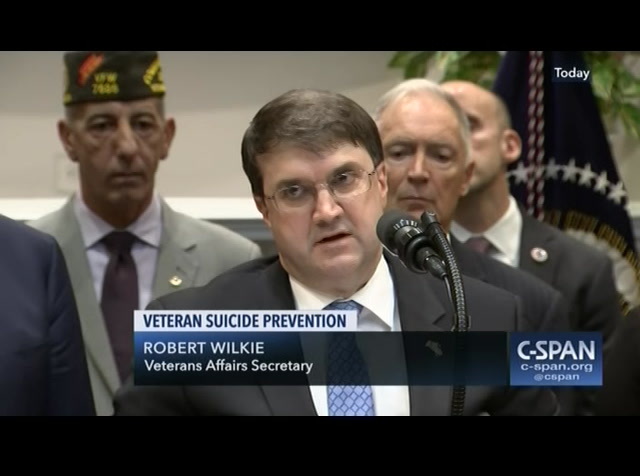 Veterans Affairs Secretary Robert Wilkie thanked the president for focusing on this issue and working to prevent the loss of an average of 20 veterans a day who take their own lives.